In this project you’ll use an infrared (IR) receiver and an Arduino to control 3 LEDs with a remote control. This is useful to re-use old remote controls or give some functionally to some of your remote’s buttons. The infrared receiver is the component shown in the figure below. This is the TSOP4838. When you press your remote control, it sends infrared modulated signals. These signals contain information that your receiver collects. Each button sends specific information. So, we can assign that information to a specific button. In this part of the project you need to decode the IR signals associated with each button. Connect the IR receiver accordingly to the schematics below. To control the IR receiver, you need to install the IRremote Library in the Arduino IDE. Copy the following code to your Arduino IDE, and upload it to your Arduino board. Make sure that you have the right board and COM port selected. Open the serial monitor at a baud rate of 9600. Press, for example, the button number 1 of your remote control. You should see a code on the serial monitor. Press the same button several times to make sure you have the right code for that button. If you see something like FFFFFFFF ignore it, it’s trash. Do the same for the other buttons. Write down the code associated with each button, because you’ll need that information later. In this part, you’ll build the circuit with three LEDs that will be controlled using your remote. Assemble all the parts by following the schematics below. Now, grab the codes you captured in the previous step. You need to convert your codes from hex to decimal. Repeat that process to all your hex values and save the decimal values. These are the ones you need to replace in the code below. 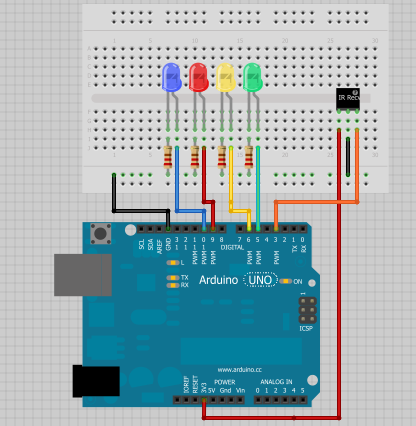 Download or copy the following sketch to your Arduino IDE. Write your own decimal values in the sketch provided in the case lines and upload it to your Arduino board. Make sure that you have the right board and COM port selected. In the end you can control each LED individually using the buttons of your remote control. This is a great project to learn about the IR receiver. There are endless possibilities for what you can do with it. For example, you can replace those LEDs with a relay to control your house appliances. This can be particularly useful because some remotes have a bunch of buttons that you never use. So, why not use them to do something useful? This is an excerpt from our course: Arduino Step-by-step projects. If you like Arduino and you want to build more projects, we recommend enrolling in the Arduino Step-by-step projects course. instalaste correctamente a IR library? Thank you for adding that information, I’ve never experienced any problem with that file though. se tiveres algum problema dps avisa! Does it matter what kind of IR receiver I use for this project? Or should any IR receiver be okay? Estou com alguns problemas no unitypro. Achas que o “Help” é uma boa ferramenta? ahah Sem dúvida que resolve o problema ! ahah Sem dúvida que é a melhor forma de resolver o problema ! cant get this to work with the arduino motor shield, please help. digitalWrite(speedpinA,LOW);// Unenble the pin, to stop the motor. this should be done to avid damaging the motor. when using the serial monitor and watching the leds on the motor shield it appears everything works execpt the analog.write commands as there is no movement of the motors. Does your IR receiver works with a simple project? test a simple Control one LED or something… and see if its working. thanks for trying my project Vance. That library works fine with Arduino IDE 1.04. What you need to do is to install the library properly… you probably skipped one step or moved the folder to the wrong place. and install it just like the Readme tells you. that didnt work – i also had to install it under userxyz\documents\arduino\libraries\…. I wasn’t trying to treat you as a noob, I was just explaining. The library works fine for me, with 1.04 and 1.5 IDE versions and it doesn’t conflict either with the NewPing library. then i only get “FFFFFFFF” values – overflow ? when you press the button it will read one value correct. and the other values after that will be “trash”. Your experience may vary if you use a different remote/IR sensor. Some sensors will work better then others. ahhhh ok … good to know that the overflow or whatever is normal – thx ! I don’t know exactly the answer for that. Read the Sensor datasheet it will definitely help. At Sainsmart you probably find the sensor that came with the kit. Usually they have everything detailed on their website. If you want more project examples we will find on the web using this library too. just search on google or instructables.com. I’ll definitely take a look at it! Estou a começar a aprender a utilizar o arduino, e o vosso site parece-me excelente! Gosto muito da maneira como disponibiliza os seus projectos e o site está muito apelativo! Estou a pensar em controlar um motor DC com um remote control. No vosso vídeo você diz que posso aplicar tbm a motores, certo? Outra pergunta, qualquer comando com IR funciona? Peço desculpa pela demora a responder, mas tenho tido imenso trabalho. Se seguir o meu tutorial, vai começar a perceber melhor como funciona o controlo remoto. O primeiro objectivo é ler os valores que o controlo remoto envia, e que o receptor lê. Depois de cosneguir codificar esses valores, basta utilizar o meu codigo de arduino e alterar as condiçoes, com os valores que o seu controlo remoto transmite. Por fim, alterar as condições if, com o codigo que vai controlar o DC motor. That is provided in the top of this post. Go to github and follow the read me file. Thanks for trying my project lester! i try your code and add Password.h library to cntrol leds, when password true, green led HIGH & pasword false, red led HIGH. Green ledpin = 13, red ledpin = 12. Now the problem is when green led HIGH & red led high too, red led did not light like green, the light is very small. Thanks for trying my project. try with another LED … are you using an equal resistor for both LED’s? oh ya, do you have an example code to input password Validation using keypad with 3 attempts?? If it is a wrong password user received another 3attempts to enter the correct one. If he couldn’t enter password correctly by these attempts he have to wait 3 minutes time more to re logged in to the system. Please check that project it will help you do exactly that. You didn’t install the Arduino library properly. Make sure you unzip the library provided and move it to the Arduino IDE libraries folder. It should work fine after you do that! how i can sent picture to you about install arduino library. Can you show me what you’re trying to convert? I would like to take remote code air conditioner merk LG , but when sent over IR send the air conditioner was not working ..
and when tried on TV merk SHARP, IR send its success ..
You should be able to replicate the signal from any remote using the library I show in this project. Is your IR emitter broken? Can you try with a different one? Esto es realmente genial, eres un blogger muy profesional. Me he unido a tu RSS y deseo encontrar más cosas en este gran blog. Además, !he compartido tu sitio en mis redes sociales! That’s definitely an easier way to do the same thing. I followed this tutorial, there were compile errors referred to the file IRremote.cpp. I did the corrections and there were no errors. I checked with NEC, panasonic and another (Sky). How can we know the format of the IR code from this sketch. I added another Serial.print to output the decimal value.